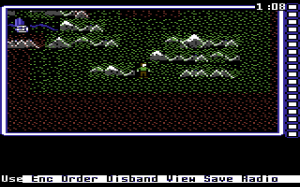 The original Wasteland (currently available DRM free with a few tweaks for modern PCs on GoG.com) was one of the first games where your actions had a decided, and persistent, impact on the game world. While there was a solid plot in place, you were more or less free to do as you wished – plenty of time to goof around as the paragraph above states. 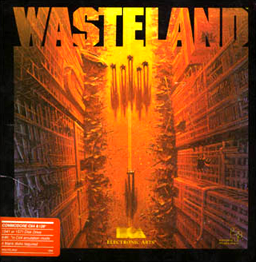 Released in 1988, Wasteland has had a steady following, garnering praise from critics and gamers ever since. 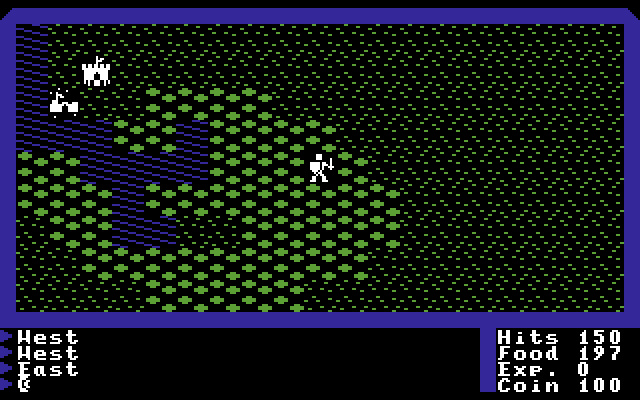 The original game was something of a mix between Ultima-style overland exploration and Bard’s Tale style interaction and combat, which makes sense. 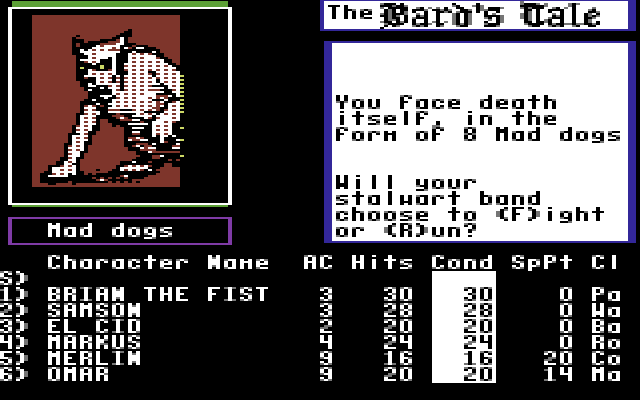 After all, The Bard’s Tale was another Interplay title released three years earlier. 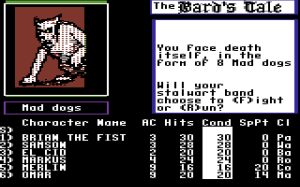 The similarities in both instances are quite apparent, and represented the state of the art in computer RPGs at the times these games were released. (The back of the Wasteland folio – Electronic Arts used to sell their games in what looked like record album packaging back in the day – actually lists the Bards Tale and Deathlord as comparisons for the game systems. 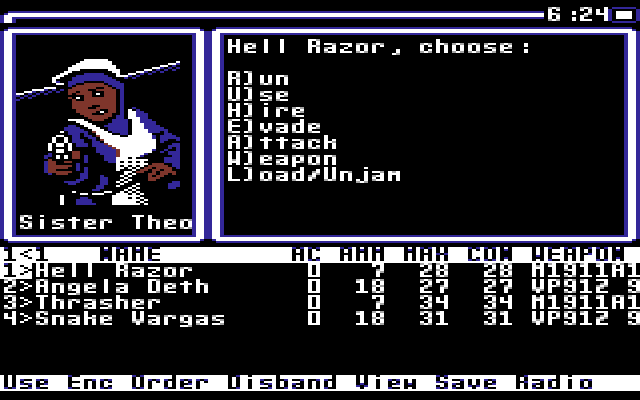 Deathlord does indeed feature a similar overland style, but it only takes up the left half of the screen. The comparison was probably made because Deathlord was also published by Electronic Arts, while Ultima was not.) 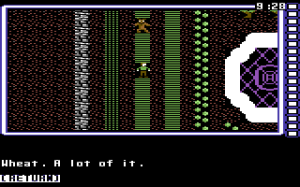 The screenshots above are all from the Commodore 64 versions of the games. Wasteland included a physical book of paragraphs was used to provide narrative that would have been difficult or impossible to do in-game at the time. 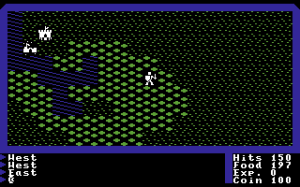 It wasn’t the first game to use this approach – the Temple of Apshai, released in 1979, used printed room descriptions to supplement the even simpler graphics of the time. 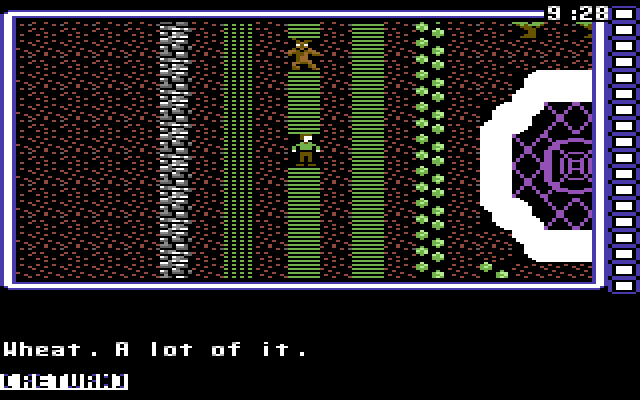 But Apshai’s descriptions were strictly that – descriptions of the rooms, traps, and treasures in the game, and not used to describe events and NPC interactions. The Wasteland paragraph book was also seeded with false information and fake plots to prevent simply reading the story right out of the manual. 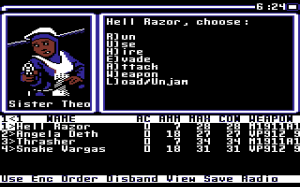 This approach put the game’s plot front and center compared the many CRPGs of the time that relied on short snippets of in-game text to convey their stories – long cutscenes simply weren’t practical given the limited storage space available on the distribution medium of the time – the 5.25″ floppy diskette. Oddly, though, despite it being ranked among the best games ever made by several publications there was never a true sequel to the game. Electronic Arts originally intended Fountain of Dreams to be a sequel to Wasteland, but abandoned that idea before it was released. None of the Wasteland development team worked on Fountain of Dreams, and the storyline was unrelated. Interplay themselves worked on a sequel entitled Meantime, but development was cancelled before the game was released. Meantime was to be set in the same universe as Wasteland, but with an unrelated story. In 1997, Interplay released Fallout, which it described as a “spiritual successor” to Wasteland. Because Electronic Arts held the rights to Wasteland, and was apparently uninterested in releasing a sequel, Fallout was created as a separate (and obviously very successful) franchise. Still, “It’s not over when it’s over”. In April 2012, InXile entertainment, a company founded by ex-Interplay head Brian Fargo, completed a Kickstarter campaign to develop a true sequel to Wasteland – Wasteland 2, with 61,290 backers contributing a total of $2,933,252 to the cause. The campaign’s original goal of $900,000 was more than tripled, and the scope of the game expanded a bit with the additional available funds. Now, two years later, we are approaching the end of the beta period for Wasteland 2 (which is available on Steam as part of the Early Access program.) The beta is currently in its eighth major update, and each new code push continues to refine the game systems, sometimes bringing sweeping changes either as new systems are implemented or due to player feedback. I’ve never seen a development team as interactive and responsive to the feedback of the fans as InXile has been during the development of Wasteland 2. Backer input has been taken into consideration during the design and implementation throughout the development process. In fact, InXile and Unity teamed up to establish the Wasteland2 Asset Store Threedee Experiment (W.A.S.T.E.) which crowd-sourced 3D artwork for inclusion in the Wasteland 2 game. 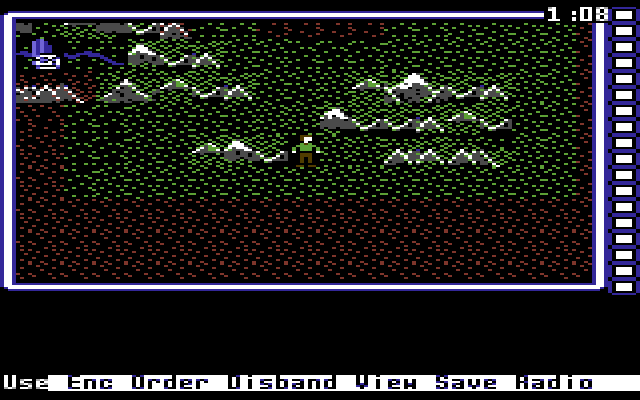 Of course, the last twenty six years have seen quite a bit of advancement in the state of the computer-game art, and as you would expect Wasteland 2 is looking pretty terrific. In a beat-up, run-down, nuclear devastation way. 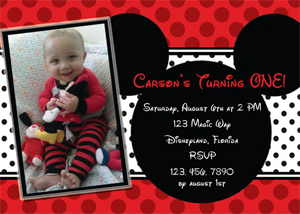 You will also run into some familiar faces. At least some of default pre-generated characters from Wasteland appear (perhaps all four, and I just haven’t seen them yet.) “Snake” Vargas now leads the desert rangers, and Angela Deth offers to join your party early on – and can be a big help in the potentially brutal battles you will face once you leave the safety of the Ranger Center. While paper-based paragraphs are a thing of the past, dialog is still a huge part of Wasteland 2. There is some voice acting in the game, but only a small fraction of the dialog in the game has voice-over. Sticking mostly with on-screen text has allowed InXile to make the game very reactive to what you decide to do in a way that pre-recorded dialog never could. New routes through encounters and situations can be introduced all the way up to release without needing to keep voice actors on speed dial. Wasteland 2 also manages to keep the central tenants of pen-and-paper RPGs intact, with a wide variety of skills available to your characters that really let you customize them. And skill use goes beyond simply adding additional dialog choices to conversations (though it does that as well.) With the right skills, you can avoid enemy raiders in the wilderness, spot hidden objects, repair equipment in the world, and countless other things. Your path through the game will certainly be influenced by the skill sets of the characters you choose to bring along. 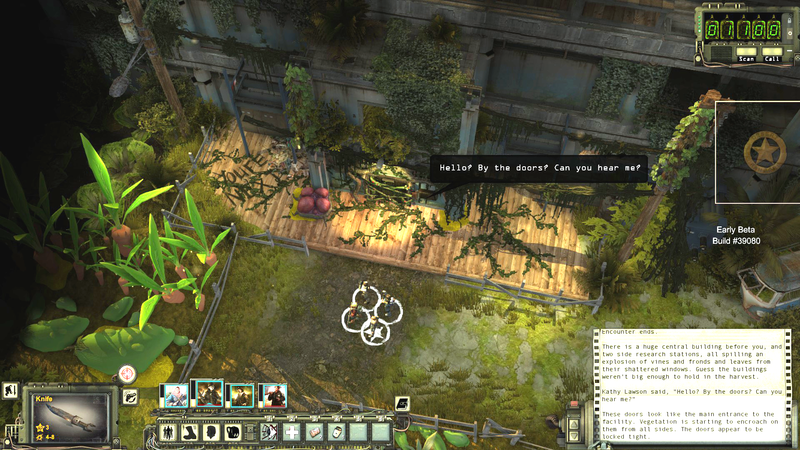 Combat in Wasteland 2 is turn-based and tactical, very similar to Fallout, with Action Points dictating how much a character can accomplish during their turn and the need to regularly reload weapons. Cover and positioning also play an important role in combat. Be careful about positioning a melee character behind someone another one of your characters is shooting at. The enemy might just dodge and let you blast your buddy. InXile has just announced that Wasteland 2 will be released at the end of August, 2013. All of the locations in Arizona are available in the beta now, which comprises about half of the area of the final game. As with the original, there is certainly no way you will experience everything the game has to offer in a single play through. Maybe not in a dozen. Will there be a Wasteland 3? It’s too early to tell, of course, but even without one, remember: It’s not over when it’s over.